The casket of Otto Warmbier is carried from Wyoming High School after his funeral Thursday in Wyoming, Ohio. Warmbier, a 22-year-old University of Virginia undergraduate student who was sentenced in March 2016 to 15 years in prison with hard labor in North Korea, died this week, days after returning to the United States. WYOMING, Ohio — Hundreds of mourners gathered Thursday to celebrate the life of an American college student who was detained in North Korea for over a year and died shortly after being returned home to Ohio in a coma. Otto Warmbier’s brother, sister and friends were among the scheduled speakers for the funeral Thursday at a high school in his hometown of Wyoming, near Cincinnati. A rabbi was officiating at the public service, which was closed to the news media. U.S. Sen. Rob Portman, a Republican from the Cincinnati area, told the throng of reporters stationed outside that Warmbier was “an amazing young man” from a resilient family and that North Korea must be held accountable for what happened to the 22-year-old University of Virginia student, who died Monday. Warmbier was accused of trying to steal a propaganda banner while visiting North Korea in 2015 and was later convicted of subversion. His family said they were told that he had been in a coma since shortly after he was sentenced to prison with hard labor in March 2016. After he returned to Ohio, doctors determined he had suffered a “severe neurological injury” of unknown cause. Warmbier’s family objected to an autopsy, so the Hamilton County coroner’s office conducted only an external examination of his body and is still trying to determine his cause of death. It was his life that held mourners’ attention Thursday as they fondly remembered a spirited student-athlete who was socially magnetic and had a positive impact on the people around him, whether it was in class, at a swim club or in his travels. His former soccer coach, Steve Thomas, said Warmbier came from a religious family and was involved in mission trips and a birthright trip to Israel. About a hundred people were turned away from the funeral as the auditorium holding roughly 2,000 people was filled to capacity. The attendees included Ambassador Joseph Yun, the U.S. special envoy who traveled to Pyongyang to bring Warmbier back. 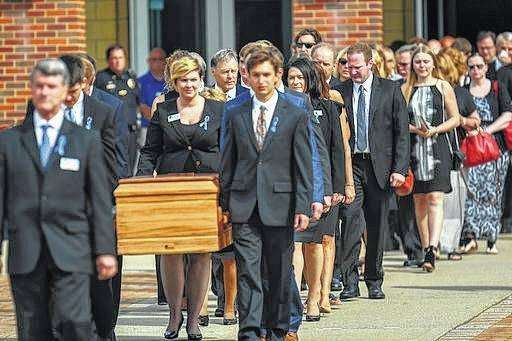 https://www.delgazette.com/wp-content/uploads/sites/40/2017/06/web1_WARMBIER-FUNERAL.jpgThe casket of Otto Warmbier is carried from Wyoming High School after his funeral Thursday in Wyoming, Ohio. Warmbier, a 22-year-old University of Virginia undergraduate student who was sentenced in March 2016 to 15 years in prison with hard labor in North Korea, died this week, days after returning to the United States.